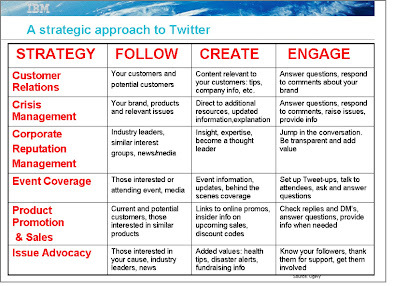 Can You Segment Your Twitter Followers and What Value Does That Bring? The matrix below was first posted on Social Media Today and was create by Ogilvy (an ad agency) for IBM. Although the original post was called “Have You Considered Segmenting Your Social Media Strategy?”, the matrix primarily speaks to how you can use Twitter and, secondarily, who you will be speaking to. Social selling – What does it mean in reality? How much more “salesy” can you get? How much harder can you beat your sales force? How much more pressure can you put onto your customers? Didn’t you overstep the line long time ago? Social selling is a new art, a new discipline, a more effective way to deal with more customers and be there when the opportunity is opening up. Clearly – there is nothing new in sales since 5,000 years. Yet once every 20 yeras we dramatically fine tune our engagement. Remember when “reference selling” – “consultative selling” – “whatever selling” – was better than what we did before? When was the last time you really looked at the picture you are using on your social media profiles? Does it give the perception you hope for? I had been using a photo taken for a press release that was twenty years old. It was good in its time and I looked younger, but it was in black and white and by others standards, a bit dated. After putting up with digs by friends when I used it for a quarterly community voice column I was writing, I started to think maybe I should redo. When I started to get very engaged in social media I knew it was time. Nov. 16-20, 2009, the Social Media Tools Week will show products in action, best practices and more. The all online event serves attendees in the US, Europe and Australia/APAC. With over 1,000 registrations, already, this will be the largest social media online event of the year. We’ll show the top reporting tools, the big 3 in networking, (LinkedIn, Facebook and Twitter for business) we’ll do several Twitter tools, social bookmarking, social media management tools and announce Social Relationship Management tools. You can register for a free ticket. But Tools Week is not only passive participation. By Nov 16 we will provide a social media directory with over 100 business relevant tools where all participants can vote on and help all of us understand how you liked them. If your favorit tool is not on it – just add it. Please create a XeeSM (your personal social site manager) with all your social sites on it. The day the Social Media Tools Week starts all participants will be able to connect with others on their preferred networks. Sharing what you saw and liked. So you may get to know likeminded people from around the world. You may want to confirm your participation publically on our Fan Page and see who else is going. That means: The Social Media Tools Week is an all online event but with a lot of possibilities to connect with interesting people around the world. In some recent social media workshops I’ve been struck by how much appreciation there has been when we presenters have taken some trouble to explain and demonstrate how various social media tools work. Even down to basics like how you go about signing up for Twitter or Facebook or on other sites. It’s made me realise how mysterious and even confusing some of these tools can be for people who are new to them. Come November, there will be an excellent opportunity for people to learn, from a range of social media practitioners, how various tools work and how they can be used effectively in a business context. Spread over five days, from November 16 to 21, the Social Media Tools Week will feature a program of keynote presentations and what are described as “career development sessions”. There is a detailed agenda on the event site. And according to the web site “Early bird registration will get a free pass …”. I’ve registered, not just because I love free, which I do, but more importantly because it’s an impressive group of speakers, from whom I am confident I can learn lots. A special feature of the programming is that the timetable has been devised so as to accommodate, as far as possible, a range of time zones from US, Latin America, and Europe, to Australia and parts of Asia. Nice one! The Social CRM Debate: What is it? And are the Two Terms Really Compatible? I am not a CRM expert but a social media consultant, so I will treat myself kindly and say that I have an unbiased view on CRM (sounds better than saying I’m inexperienced). However, I do know enough to know that – using the broadest definition of the term – customer relationship management is not a bad thing. If we all managed our relationships better, everyone would be happier. However, CRM seems to be more about data mining to better exploit customers (and I am using “exploit” non-judgmentally). The top-down approach is what – ultimately – gets in the way of developing relationships with customers based on trust. I think that being “social” with customers and potential customers is a very different thing. Through social media you have the ability to relate in ways that are similar to real life. The difference is that you can connect with hundreds of people, not just a dozen or so. Social media is obviously enabled by technology, but it is essentially about the people who converse there. I think that companies like Oracle and the multitude of CRM vendors are not going to create products that enhance relating in the social media. For one, the solutions are not all that complex to build and there will not be enough money in it for them. Anyone who comes up with a way for people to put their many friends, colleagues, and acquaintances in various buckets so that they can relate to them as a group of individuals will succeed. It is tough to have to go to Facebook, Twitter, LinkedIn, Flickr, YouTube, Delicious, TripIt, etc. to see what individual people are doing. If I were a sales person, I would want to be able to more easily engage with my active prospects or my top customers as a group. I would want to be able to see what Joe Brown was doing and get engaged with him, then look in on Mary Jones, then Charles Williams. It is a simple flip from the “place” perspective (Facebook. Twitter, etc.) to the “person” perspective that will make social media easier to use and obviate the need for CRM. Just recently I was part of an interesting discussion. My friend “Joe” (name is changed by the author) just didn’t want to even know about that impersonal online world. If I can’t find you on Facebook, LinkedIn, Twitter or see anything from you on YouTube or any other places, I just don’t know anything about you. If I Google you I have no way of getting to know you. I couldn’t even find a website. The only way is a phone call or F2F – like in the old days. You are NOT approachable. Doing business with you is very hard at this stage. Now – imagine you write a blog about your subject matter expertise and this blog is easy to find. You have a few photos from you and your family on Facebook, you tell the world you love Australian Syras and be a mountain biker, your two month old daughter does a new trick and on and on and on. Now assume you announce to call me and want to propose some business. You let me know all about you by sharing your sites. Assume I have an alternative contact and connect with somebody I know all about and it feels like I know him already very well. Don’t you see your competitive disadvantage? BINGO – that was the trigger. Hello LinkedIn, Facebook and Twitter – you just got yourself a new user. Clearly – there is no substitute for Face to Face meetings and phone calls – but it’s a waste of time and just way too risky to have a first meeting just to find out who the other person is. The best way to introduce each other is online – getting the full picture and being APPROACHABLE. Managing your time wisely and effectively to allow yourself to write a blog, a column, a newsletter and a book review, may be easy for a seasoned journalist, but a technically focused, word-challenged, social networker needs to have other strategies in place. Fellow marketing consultant and friend Steve Gasser and wife Beth recently had a good post on their blog about 5 tips to writing regular blog posts . It provided some good tips to generate ideas on blog topics. Some I plan to implement. What I really need help with is a bigger topic – that of overall content generation management, before time management gets the best of me. Is it a problem because I am an engineer? Here is my problem. I am an engineer. I never really liked to write much or thought I was very good at it. I did take an interesting college writing class and it explored some new areas for me, but I stayed an engineer and really liked lab reports. I actually believe that my identical twin sister has the real creative writing talents. As in everything I do for my clients, I am trying to build an authority blog strategy that will help them be successful and also learn about social media at a deeper thought level. What’s hard it figuring out how best to integrate writing for these commitments with my work and everyday life without living on the computer, attached to it like an umbilical cord. The Internet and search is about content. Google loves user generated content. Social Media sites are the search engine’s darlings at this point in time with new fresh content being generated in 140 character bites or more every second. Writing should help people find me in the clutter of consultants, websites and people on the Internet. I write for my blogs – Network Mindshare and Wisconsin Social Media, a column for an online magazine – MadisonSocialMediaExaminer.com (bi-monthly), a book review – BookReview.com (monthly), a column for an online newsletter – financial services newsletter (monthly), local news sources, as well as for two other blogs that ask me to be a contributing author – Customer Think and Social Media Today(occasional). They are all important for me to be recognized as an expert and authority resource in my area of expertise. I also try to comment at least once each day on other blogs that I find interesting, stimulating, controversial, or in my hobby area. All this takes time and I am finding that I must manage my time better and be as creative as I can with what I do write. As an example – I took a time management quiz with a friend and was just shy of the category for “immediate intervention help” with my current schedule and hectic management style. It would be great if I could write one post, twist it and reword it, then place it everywhere. But each writing assignment has a slightly different emphasis. No one says that blog posts or articles have to be a particular size to be of value. Chris Brogan and Seth Godin often have very short (200-400 word) posts that are very direct, focused and insightful. Brian Solis has some very long ones that I set aside to read with more time. Axel Schultze of the Social Media Academy, recently had a bunch of short small thoughts. It was like getting a handful of M&Ms that left you still wanting more. If you have an inspirational moment and write a tome, stop before you post it and see if you can’t post pieces throughout the week that have a soap opera effect and draw your readers to click through each update to see where the story goes. I also recently started to collect my blog comments each week to post as a collective summary each week. I found that if spent that kind of time on reading and commenting, I should use it somewhere else. To Do – spread sheet with items organized by date and also placed on my daily calendar. Blog Ideas –thoughts and pages found in magazines, books and Internet (bookmarked on delicious, digg, stumbleupon). Blogging Tips – suggestions found on the Internet (bookmarked on delicious.com). Interviews – I carry a flip video and digital camera with me all the time. Perfect for impromptu interviews that can be video posts or transcribed. (bookmarked also on Youtube). Articles – Ideas for articles, scans of other articles that impressed me, research, white papers, ebooks (bookmarked on delicious, digg, reddit). Book Reviews – ones you do yourself and ones by others (posted on Squidoo, Amazon, website, blog, online newspaper). Can anyone help by adding your own ideas? If you have a blog, what strategies do you use? Comment back and perhaps we can all help each other. I hope to make some progress and actually sleep some nights instead of writing. I am not a CRM expert but a social media consultant, so I will treat myself kindly and say that I have an unbiased view on CRM (sounds better than saying I am ignorant). However, I do know enough to know that – using the broadest definition of the term – customer relationship management is not a bad thing. If we all managed our relationships better, everyone would be happier.